Additional Info: Interior completely refurbished for 2014. Price Includes bed linen, hand and tea towels. 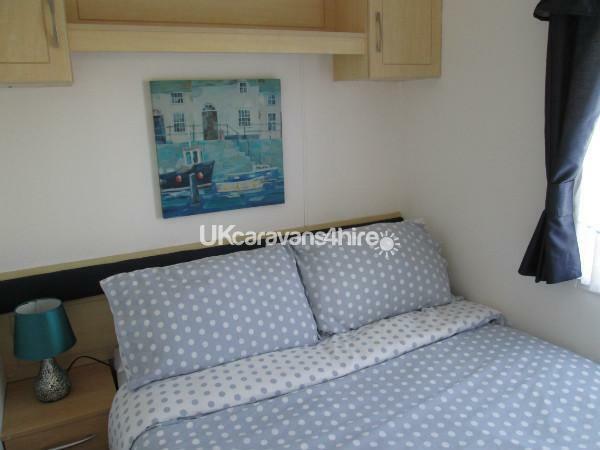 Features hot and cold air conditioning, ironing board and iron. 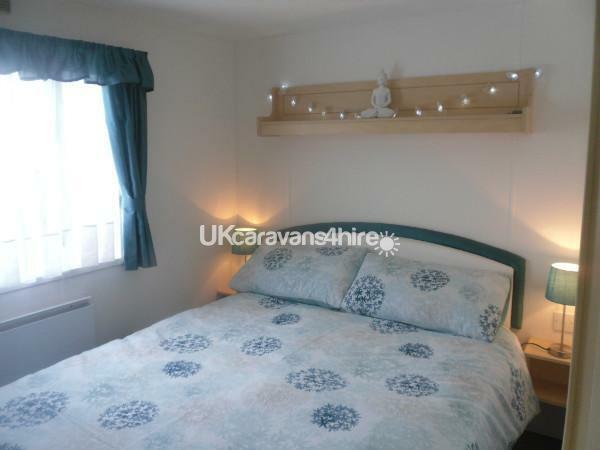 This is a well laid out recently refurbished caravan to ensure you and your family can relax and enjoy a well earned break. 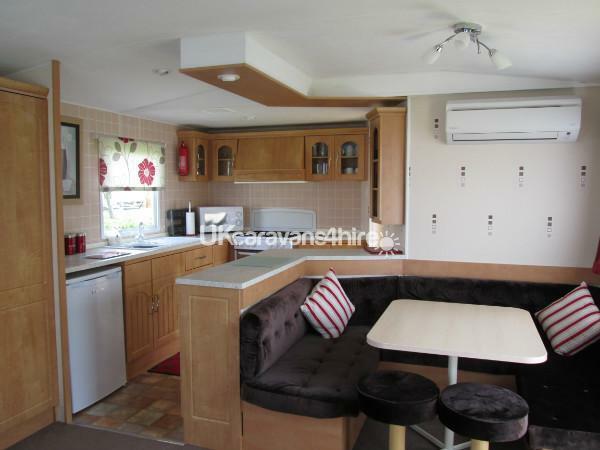 There is a spacious open plan living room/ dining room area and the caravan has hot or cold air conditioning throughout for extra comfort. Bedrooms: 2 double bedrooms and 1 twin/double. 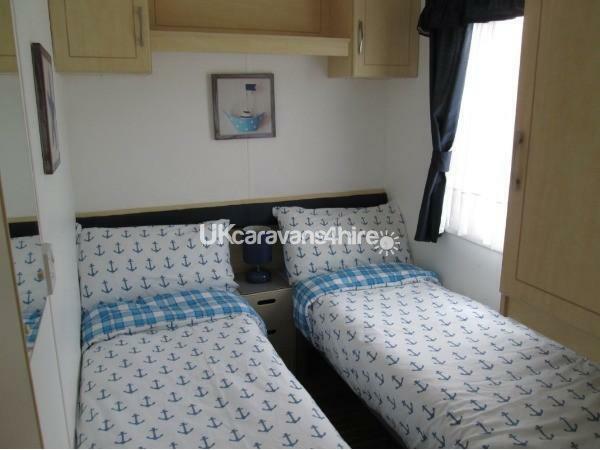 Beds come with all bed linen and rooms have bedside lamps and some wardrobe/storage space, Also has TV in master bedroom. 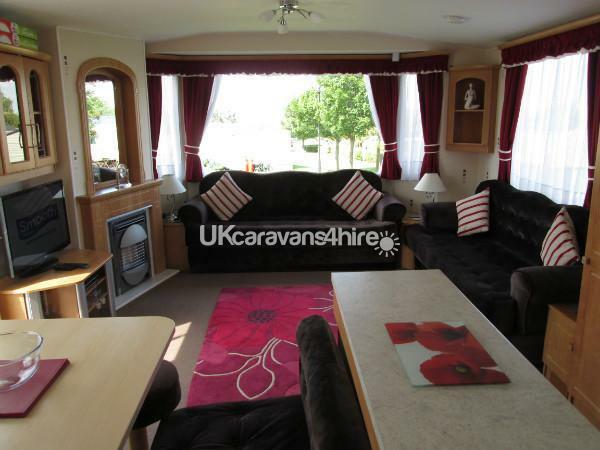 Outside: complete paved area running the length of the caravan, large wooden picnic bench (4 seats), glass top table with umbrella & chairs (4 seats) and 2 sun loungers. Miscellaneous: mop, bucket, vacuum cleaner, airier, iron and ironing board, rotary clothes line. Allhallows Leisure Park itself has ample amenities to keep you and your family entertained and as active as you want though-out your holiday. There is a club house which can provide live entertainment, licensed bar, restaurant, pizza bar, bingo and also a kids club to keep the little ones occupied. Outdoor and indoor swimming pool (with lifeguards), fresh water fishing, 9 hole golf course on site, crazy golf, tennis, bowls, archery, shooting, amusement arcade, pony trail, petting zoo, beach, and four wheeled golf type carts for site touring. 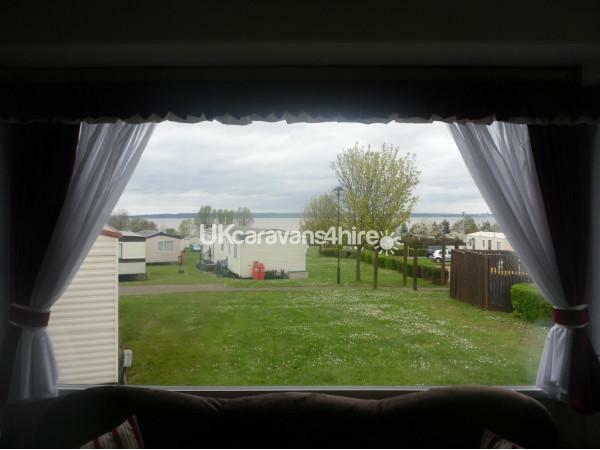 NOTE* The charges for activity passes are not included in the cost of the caravan hire, but the passes can be obtained from the reception upon arrival at Allhallows . Allhallows Leisure Park also has a small supermarket and launderette. Local attractions include the historic Chatham Dockyard (where HMS Victory was built and also includes the submarine HMS Ocelot and HMS Gannet), Chatham Marina, and Chatham cinema, Dickens World, Leeds and Rochester Castle and Digger Land Adventure Park are all a short car journey away. Bluewater shopping centre is 25 minutes, award winning Herne Bay beach is 40 minutes away and the distance to London is 30 miles. Some local takeaway menus can be found in the caravan and there are several country pubs nearby. Weekly bookings are taken on a Sat - Sat basis. Weekday short break bookings are taken Mon - Fri, but no just weekend breaks. With all the above facilities on offer at Allhallows you are sure to enjoy your stay and may want to return time and time again! Additional Info: Outdoor pool. Grocery shop and launderette. 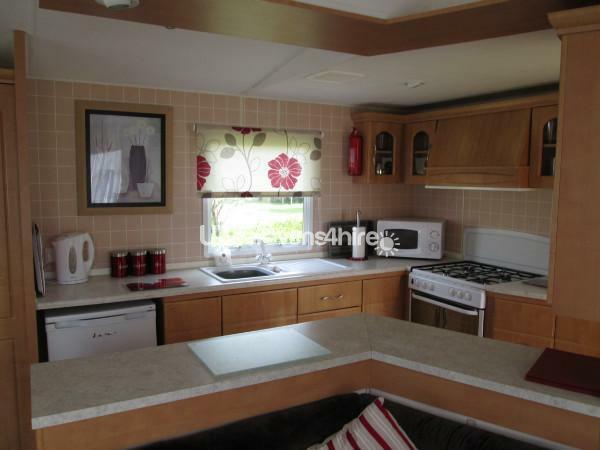 Great quiet location, a nice clean and well equipped caravan. 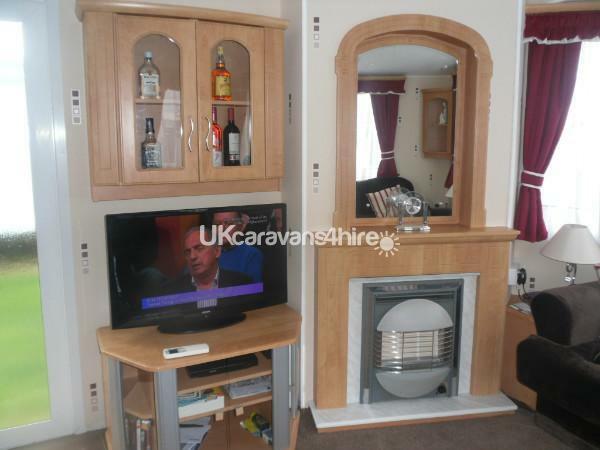 The caravan was very warm, which was much appreciated considering it was the end of October. Mike and Linda were very accommodating and helpful and many thanks to them for allowing our two little dogs to stay too. 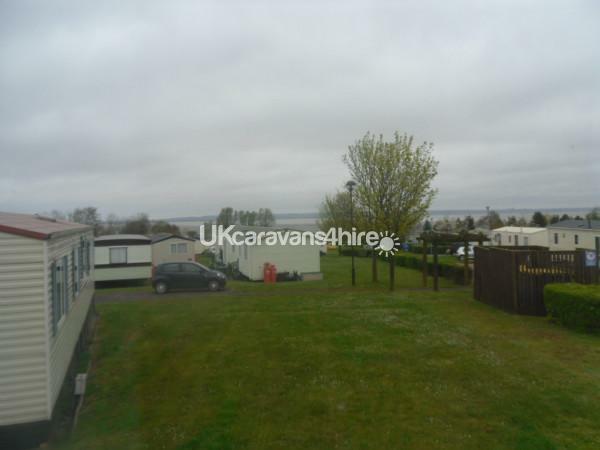 This was our second stay at all hallows leisure park and staying in Mike and Linda's van. Once again it's was a wonderful holiday and a home from home. Everything we needed was avalible to us and Mike and Linda were very accommodating and helpful. Will definitely be using them and their van again. 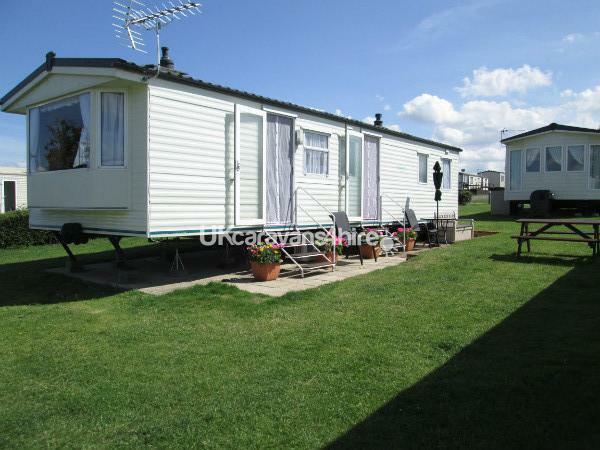 We were a family with grandparents, parent and granddaughter and your Caravan suited us all. Two,toilets were great. The caravan had everything we needed, nice and clean and welcoming. Mike and Linda were very kind and accommodating. Nothing too much trouble. We had a great week and enjoyed,our stay. 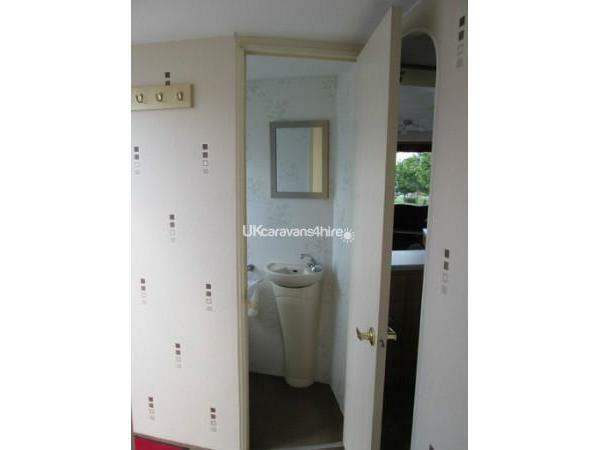 A wonderfully kept caravan very clean and welcoming. Has everything you could possibly need. A real home from home. Close to all ammenmaties on the site Already booked to return next year. Dear Reader, From the first email enquiry to the last day of our holiday, Mike treated myself and family with the upmost respect and professionalism. The holiday was booked in no time and within the hour Mike was emailing confirmation and information of the site and any additional requirements we may have. Mike and his good lady wife made sure the Caravan was like a five star hotel, with Air Conditioning! well needed during the trip. My wife attended on her own with the children, Mike and his wife greeted them at the gate and they went to the Caravan to explain about the site and all the safety & security requirements of the holiday home. They made my wife feel very welcome and comfortable. The Caravan far excels the pictures and has a very homely feeling with pictures and books to read, all you need for your holiday. The view from holiday home is also spectacular, due to the great pitch location. The site also has all the pools, entertainment for a family both day and night, or for a single couple who just fancy a break. All the staff are very helpful. So all round a perfect holiday for all. Well done Mike & Co. See you next yearâ€¦ Ian..